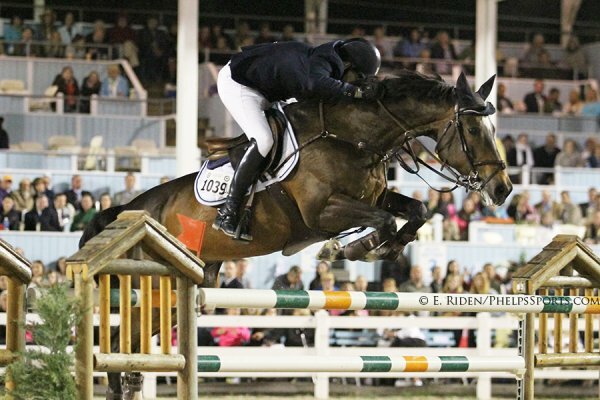 Paul O’Shea and Primo de Revel won the $100,000 Devon Grand Prix. It was very cool to watch the $100,000 Grand Prix at Devon from the comfort of my living room chair. I miss the smell of the horses, the dust from the ring, and the crowds, but you got a darned good view on the live streaming and if you missed something you could go back and watch it again. It was a tough course — only nine of the 31 competitors were able to jump clear in the first round of competition at Devon last night. In fact, the initial time limit was adjusted down by a second after the first few riders finished over the limit. In the end, it was an elite group of riders, four of whom brought two horses to the jump off: Maclain Ward, Laura Chapot, Paul O’Shea and Kevin Babington. Also going clear was known speed demon Todd Minikus. Ward was riding last year’s winner, Rothchild, and was looking to win his 10th Devon Grand Prix. It was an exciting jump off with O’Shea, riding the 13-year old Belgian Warmblood gelding Primo de Revel, to victory with a winning time of 38.95 seconds. Second place went to Minikus on the 11 year old Oldenburg mare Quality Girl, who clocked in at 39.63 despite breaking a snaffle rein on course (superb job of riding despite the equipment failure). And Ward was third on Rothchild with a time of 40.798. Note: On Saturday night, with a new set of reins, Minikus and Quality Girl won the $50,000 Idle Dice Stakes. Below are the top two finishers of the Grand Prix but you can still watch all of the events on the USEFnetwork on demand.